For the past several months we have been working on hacking our curriculum for 2017. Our Upper School faculty has been collaborating on new courses for next year. The discussions have been driven by three questions from our Manifesto. How might we inspire one another — and the larger world — through the work we undertake together? We initially posted displays in the Hive for teachers and students to comment on during a 2 week period. There were several informal meetups organized during our lunch/enrichment period. We provided examples of courses and schedules from other schools, documents from our current academic program, prototypes from our faculty members and external constraints that we have to consider. The process led to lively discussions between faculty members but we knew that there was something missing. So, we decided to include students in the process. This gave our Upper School Leadership team additional information to consider during the approval process. As you can imagine, we learned a ton from our students that informed our decision making process. The end result is that we’ll be rolling out new interdisciplinary courses that are inquiry based and incorporate real world connections. All were vetted by the students prior to approval. Let’s see how the students respond in January. I would love to hear how other schools include students in academic program discussions. Please share what you are doing. We live amidst a fundamental reordering of how we think about school: from the centuries-old belief that content knowledge is its central currency, to the nascent understanding that what you know matters less than who you are, and what you are uniquely capable of impacting. Across the country, communities and schools are beginning to test this shift in myriad ways. But overall, educators, parents and community leaders are still in search of a well-lighted path that can illuminate what the future of education will actually need to look like — and require. A clear and compelling organizational mission. Cultural norms that invite people to step outside of their comfort zone. People-centered design principles that guide teaching and learning. And six timeless, significant habits of mind. We choose to engage and explore all scales of community. We welcome the chance to live at the edges where disciplines mingle in search of maximum impact. We want our school to be a destination for anyone who wishes to design a better world. We want our school to create intermingling rivers of connection between people, ideas, and sectors. We want our school to embody a new notion of what “school” is and does. We choose to wander and to wonder. We seek to create a learning environment that invites all people to follow the sparks of motivation, interest and curiosity as far as they can take them. We seek to provide paths of faith and curiosity. We seek to nurture experiences of deep purpose and joyful play. We seek to model living, learning mindsets that constantly adapt and expand. We choose to make our thinking visible and actionable. We envision learning in which children are seen and heard. We envision transparency in the learning journey — process, product, and progress. We welcome the chance to wrestle with voices and perspectives that challenge our assumptions. We envision learning in which our trust for each other strengthens our sense of individual freedom, autonomy, and interdependence. We choose to experiment with extraordinary ideas that might one day become the norm. We will not just build a roadmap for future generations of MVPS students and families; Mount Vernon will continue to carve a path for the future of learning itself. The City of Atlanta has big plans for the future especially since they are projecting 2.5 million new residents over the next 25 years. The city has created a comprehensive development plan and one of the ways that they are increasing awareness and gathering information from Atlanta residents is through their new Atlanta City Studio. The lab has a variety of displays, many of which are interactive. This pop-up lab will be at Ponce City Market for 6 months and then move to another area of the city. During my visit I was greeted by a staff member who took me on a tour and explained all that the projects on display and the process they are using to engage with the Atlanta community. enhance the socioeconomic, ecological and sustainable urban design form for the city. My visit there this weekend got me thinking about how we could use a space like this at Mount Vernon Presbyterian School. My first thought was that we can use it to gather information from our community that will guide us in our strategic planning process and to share information on our academic program. The space can also be used with prospective families who are thinking of attending your school. Visitors can maneuver on their own or be shepherded through by faculty members, students, parent volunteers or administrators. Take a look at what #ATL City Studio has and how your school can benefit from a pop-up lab. Imagine a student showing these panels to parents and having a conversation on the topic. Any community member who serves in a host role will have to truly understand these ideas and what they mean for the school. This interactive model allows visitors to redesign city blocks. This summer I have had three amazing learning experiences that were each very different, yet they connect to our mission at Mount Vernon Presbyterian School. Here is my first pass at a brief overview of the takeaways. Using the local environment for learning – Right from the start we were working with John Weiss from Human Design to consult on their Social Action Machine Project. Starting out on a non-educational project was the perfect way to get the creative juices flowing. This was also a reminder that we need to search for projects for our students that are outside the realm of our walls. Project-based learning – Nicole Martin and I joined the Integrating Disciplines Through Real-World Learning session. We were immediately put on a bus and traveled to visit the site of a 6th grade project that involved ecology, economics, government, sociology and many other disciplines. After the group listed their community problems Nicole and I latched on to transportation and traffic in our area. More to come later on our ideas for a schoolwide project on this problem. Entrepreneurship – We learned about Startup Weekend, a program for teenagers that is held in cities around the country. Our task was to study the organic food market and pitch a start up. The highlight was our visit to a Whole Foods. We observed and interviewed shoppers in the store. We got a taste of immersing ourselves in the research and empathy process. Consultivations – Our students are so much more capable than what we typically give them credit for and Meghan Cureton presented how our Innovation Diploma students consulted with an organization on the design of a pocket park. Here’s an article from a local newspaper explaining what the students accomplished. The best part of the entire experience was learning the DEEPDT process while working with Refuge Coffee. Refuge is an amazing social business that strives to create community for Clarkston residents. In doing so the company also allows for newly immigrated refugees to earn a living wage and develop skills, including English language. Clarkston has the reputation for being the most diverse square mile in the world. The learning was fantastic and the relationships that we built with the Refuge team were moving. Pioneer Lab with Education Reimagined in Washington D.C.
Pioneer Lab in Washington D.C.
Education Reimagined has created a vision, a new paradigm, for the for the future of education that is Learner Centered and the five elements are listed below. The second piece of learning was around the change process. It’s fascinating to understand how extremely difficult it is for people to move from one paradigm to another. The most telling example was how medical professionals believed, for 2000 years, that bloodletting was the only way to cure diseases. It took new scientific knowledge and extensive research for medical professionals to shift this paradigm. someone with a different paradigm. What does this new paradigm mean? The learner-centered paradigm changes our very view of learners themselves. to…well, be. And, that changes everything. I look forward to participating in this important work. WOW! These were all inspiring experiences and they have helped me grow as an educator. In my last post New Learning Spaces = New Flow of Learning, I shared the plans for a new Upper School building at Mount Vernon Presbyterian School. I have been fascinated by what this new campus will mean for learning at our school and am fixated on finding comparable spaces. Earlier in the year, I had the opportunities to visit the James B. Hunt, Jr. Library and North Carolina State University and the G. Wayne Clough Learning Commons at Georgia Tech. Both places provide learners with flexible and open spaces. While these amazing facilities help me to study how learners use the space, I keep asking myself, “Is the type of use in these libraries different than how are teachers and students will use our new building?” (What I’m about to write actually makes me chuckle.) In general, it appears that students determine how the space will be used. They can work individually or in groups. They can play video games when they want. They can get assistance from librarians or writing tutors on demand or they can use the technology when needed. These spaces don’t seem to be teacher driven or collaboratively driven by teachers and students. So, if we took over Georgia Tech’s Learning Commons for a week, how would we organize the space? Where would the teachers and students go and how would the space be used? What would the flow of learning by like? These are the questions that I am wrestling with now. We are planning to convert current classroom space to make it more flexible next year and we are searching for schools who are already experiencing teaching and learning in these flexible spaces. If you’re one of these schools, let’s talk. Over the years I have followed newspaper articles from communities where grading and reporting changes have taken place and quite often the conversations lead to heated arguments, animosity, teachers getting suspended and/or fired, principals getting losing their jobs and court cases. Possibly the most controversial change that really gets tempers flaring is when schools decide to not assign zeros to missing student work. 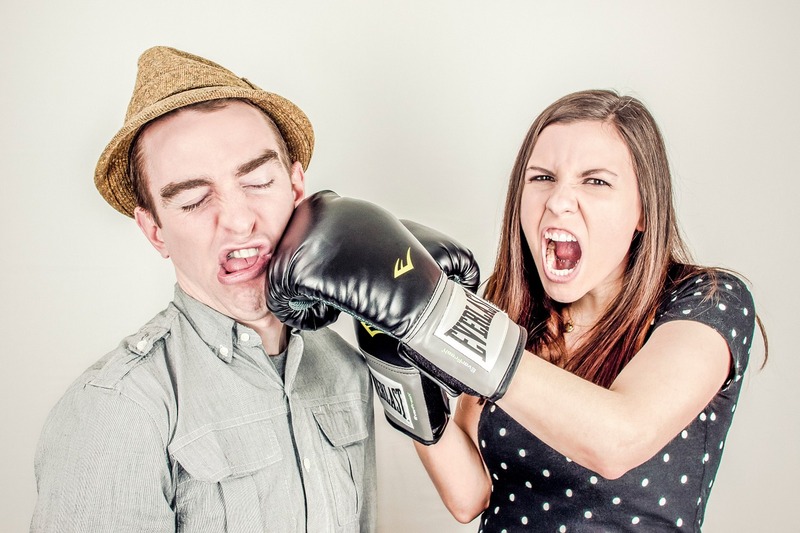 While the two sides don’t usually get physical, the battle can be nasty. Under these circumstances it’s very difficult to change overall practices. Instead of the focus being on changing assessment practices to improve learning, individuals take a myopic approach and the two sides get bogged down in the single issue. The fear of having to face upset parents, students and teachers typically leads to continuing the status quo. The status quo, even though flawed, is just easier to continue. Fortunately, the Graded community was appreciative to discuss assessment practices that improves learning. Our teachers, parents and students saw the value of being able to give feedback to students on academic performance and separate feedback on learning habits. There wasn’t a battle around the typical divisive issues (i.e. zeros, extra credit, participation, group grades, homework grades). The only issue that created a stir throughout the year was reassessments (more on this in another post). 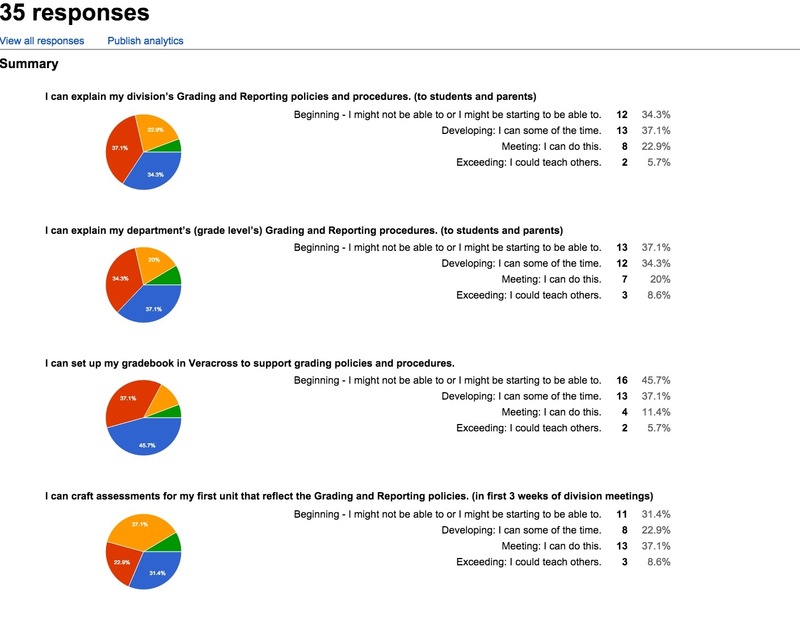 These are the responses from the high school faculty at our opening faculty meeting for the 2014 – 15 school year. From the start of the year we were continuously learning in these four areas (and others). That it is never too soon to prepare for rolling out these changes. Ask teachers to respond to these prompts as early as possible. Having a community that supports the concepts and initiative makes the rollout easier. Even when you have the support of the community, there will be disagreements and critics.